The back-to-nature aspects of our trip (see part one and part two) didn’t end with our return to my parents’ place. My parents don’t farm, fish, or raise chickens. 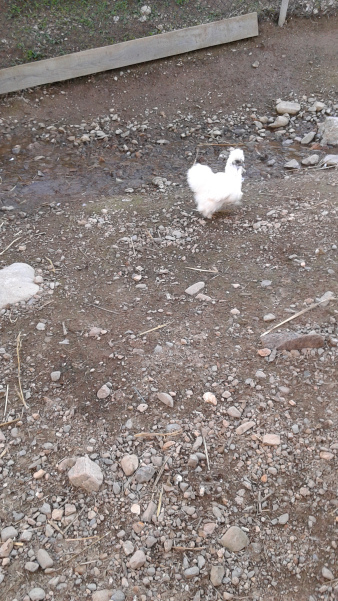 But they have neighbours who do (raise chickens at least, not sure about the fishing). Occasionally, when these neighbours are away, my parents take on the task of caring for the chickens. This includes making sure they all go into the hen house for the night. Back from the wedding, I decided to join the party. Who doesn’t want to wrangle chickens. Here’s a picture of the pen. Yes, that would be a dead crow hanging over it. I know it would be more Poe if it were a raven. Close enough. 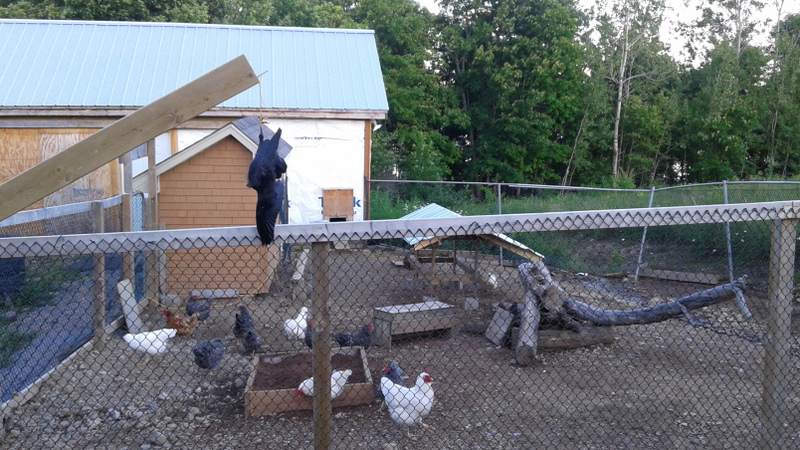 Apparently, crows were terrorizing the chickens. The owner of the chickens sought revenge. He shot a crow and hung it out as a warning to the other crows. It turns out, this is exactly how to deal with menace crows. I’m told, shortly after the above crow went on display, the powerlines filled with every crow within flying radius. They had a wake for their departed friend. Not sorry I missed that. Then the murder (so apt they're called that) of crows flew off and not one has been seen near the coop since. I wish I’d known this trick back when crows were tearing apart my garbage every single garbage day. I’ve filed the info away, hoping I'll never have to use it. 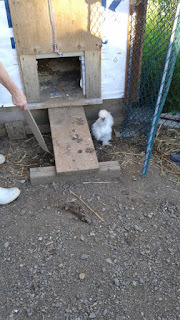 As for the chickens themselves, getting them to go to bed was no easy task. Brooms, sticks, boards, and my brother in law with a chunk of mesh fence running around in circles, and most of the chickens were still outside. I thought they were adolescents (it would fit their behaviour), but nope. That’s a fully grown chicken. And she’s supposed to look like that. They are my niece’s favorite. I suspect she can tell they belong in a Dr. Seuss book. Oh The Chickens You Will Chase.